Does Wind Chill affect Home Heating & Comfort? Your furnace may not keep up. During extreme winter weather episodes, it seems the term wind chill is the most talked about measurement. Let’s finally describe wind chill and then determine if this chilling-effect affects your home and your home comfort. The human body constantly generates and loses heat. The rate at which we lose this heat is most influenced by the surrounding air temperature. We feel colder when the air is cold since this increases the rate of heat loss from our skin to the air. This heat flow is increased if our skin is exposed to the cold air and also a wind. Thus, the wind chill temperature is trying to quantify how much colder your skin feels in the wind. Someone actually quantified the heat flow rate with wind and compared it to the heat flow rate experienced in a colder air temperature with no wind. I heard wind chill only affects humans? Your body is a heat source. Losing heat is a cooling process for any heat source. However, this cooling process stops when the heat source is finally cooled to the temperature of its surroundings. Your car, sitting outside overnight in zero-degree air with a wind chill of -20, will chill quickly to zero. No colder. The next night at zero-degrees and no wind, your car will eventually chill to zero-degrees again, although it will take a bit longer to get there. The cooling rate or heat flow rate is greater in a wind. Wind chill affects every and all objects, until it doesn’t. It stops having an effect when the object is the same temperature as the actual air temperature. Any warm heat sources like your body or your home, that are trying to maintain a warm temperature in a cold environment, will all be affected by wind chill. The affect of wind on homes will vary with every home. 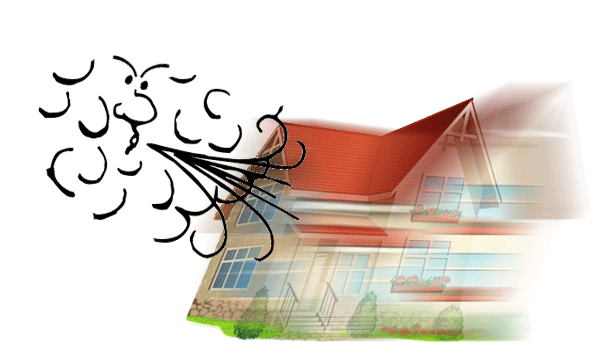 Wind will increase the cooling effect on a leaky home greater than an air tight home. Imagine you are in your car, stopped in traffic on a cold day and you crack the window for a bit of air. As long as you are stopped you may remain comfortable. But as you finally get back to 70-mph, the extra wind entering the open window is too much and you’re cold. So, you close the window (tighten up your car) and regain comfort despite the 70-mph wind outside. In the same way, a tight home is easier to heat and comfort, despite windy conditions. If your home is drafty in the winter, or if you accidentally leave the fireplace flue open or a window is not fully closed, the cold wind is going to have a noticeable effect on your home heating and home comfort. When the weather personalities on TV start droning the expected wind chills for this week, make sure your home is buttoned up and as air tight as possible. It could make the difference in your heating system maintaining your comfort or failing.